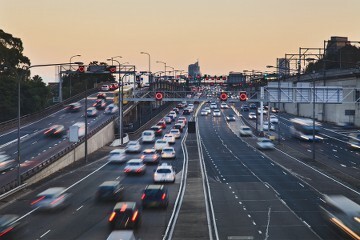 The number of vehicles on the road is increasing as is the population and as second hand cars become cheaper. There have been measures put in place in certain countries to tackle the problem of congestion and pollution caused by excessive vehicles on our roads such as a numberplate day designation in Athens. What this ... Read moreRoad Traffic Accident Compensation Claims: What Evidence Should You Get? The post Road Traffic Accident Compensation Claims: What Evidence Should You Get? appeared first on Personal Injury Solicitors Machester. The number of vehicles on the road is increasing as is the population and as second hand cars become cheaper. There have been measures put in place in certain countries to tackle the problem of congestion and pollution caused by excessive vehicles on our roads such as a numberplate day designation in Athens. What this meant is that cars with specific numberplate would only be allowed on the road at certain days and others for other days. This caused a bigger problem than a solution as people would buy another really cheap car to run on alternate days because of the numberplate law. This created more pollution and thus accidents on the roads. Being cautious is probably the number 1 thing you can do to avoid being involved in a Road Traffic Accident (RTA) and look out for obvious hazards. Being safety conscious and wearing your seatbelt, having your head rest up high to support your head, wearing glasses to see clearly if required and other such precautions are all essential to a safe journey. There are however instances where due to other people’s negligence, there is nothing you can do to prevent an accident from happening. In this case the hope is that you avoid an injury all together or if an injury is to occur, for it to be only minor. Just the number of vehicles alone on the road mean that the statistics of you having an accident and sustaining an injury are higher than in the past. Driver’s information: Make sure you take down all of the other driver’s information including their full name, address, phone number, place of work, passenger details (if any other passengers were present). Car Details: Make sure you take down all the details of the car including the car registration number, the make, model and colour of the car, the owner of the car (if the driver is not the owner of the vehicle) and details of the damage caused. Insurance Details: Make sure you take down all the insurance details of the other driver and vehicle including the name of the insurance company that insures the person and the vehicle, the phone number and address details (if possible) of the insurance company and the insurance policy number (if the driver has it). Photographic Evidence: If possible, take a picture of all cars involved in the accident from as many angles as possible that include the damage done to each vehicle, the road behind, the road ahead, any skid marks. If possible, take a picture of the other driver’s face just in case they are not who they say they are and are committing fraud. Witness(es) Details: If present, make sure you take down any witness(es) details such as their full name, address and phone number so that they can be contacted if a statement is to be provided by them to prove which party was liable for the accident. Police: It goes without saying, but make sure you ring the police in order to report the accident as they will take down a report of what happened and speak to any witnesses that are there in order to solidify proof of liability if possible. How to Chose a Personal Injury Solicitor for Your Case? Make sure that they are accredited by the law society. You can check their website for accreditations. Make sure that their website and contact information is available including their address details as some companies don’t list them, which is a bit suspicious. Try and find and read reviews from other past clients of theirs in order to see what kind of feedback they have received so that you can judge if they are the solicitors for you. If possible speak to your friends and see if they can advise on an appropriate lawyer or if they have had experience with the firm you are looking at and can recommend them. Lastly, speak to the firm directly and ask them questions in regards to your accident and see from the responses you receive as to whether you feel happy to proceed with them. If you have been injured in a non fault Road Traffic Accident, Personal Injury Solicitors Manchester specialise in RTA claims for compensation and work on a no win no fee basis. We will evaluate your case and advise you accordingly. Contact us on 0161 82 11 229. The post What Can We Learn from the Deadly A580 Accident appeared first on Personal Injury Solicitors Machester. Sunday 22nd June 2014 will be a day to remember for the families of Aaron Tulsa Jones and Amy Louise Hobson but not the good kind. This was the day when their Vauxhall Corsa was “ploughed” into by 2 high powered Audis; an S3 and an RS3. 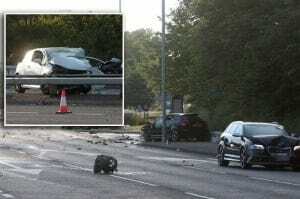 The drivers of the 2 cars were both male, between the ages of 25-30 and were racing on a public road for reasons unknown. This collision caused Aaron and Amy to lose their lives (Aaron at the scene of the accident and Amy at the hospital later on). The 2 men were arrested on suspicion of dangerous driving and are being held and questioned in custody. More on the report by MEN here. Endangering your own life as well as other innocent people’s lives is never to be taken lightly. Irresponsibility, reckless behaviour and a total disregard for public safety and the law are unacceptable in every case, yet when it comes to cars, people can “forget” these. Speeding is illegal and so should not be done under any circumstance. If you want to race, there are plenty of racetracks available in the UK and also high powered car experience days on the racetrack that you can attend to get your racing thrills. On the public highway however is another matter which can (and in this case has) lead to very serious consequences. Don’t get carried away of peer pressured into doing something that you do not want to do, or know inside you that it is wrong and can cause an accident. Be the bigger man and stand up for what you believe in. This builds character and also gains you respect from your peers, and if not, they were never the peers that were suited to you. There are 2 consequences that you have to live with if you were one of the men who caused this road traffic accident. The first is the legal and criminal side of things and the second is your own personal feelings of regret, anger, remorse and so forth. The repercussions of this are felt for a life time. Being in prison may not (and most probably won’t) last a life time however after coming out of prison, their quality of life will be bad from the point of view that they won’t be able to drive as their licenses will be taken off them, their insurance premiums will be sky high and they will have a criminal record which will affect their ability to find employment. This ranges from person to person but the usual feelings of anger, denial, sadness, remorse would come into play at different stages for the individual. It will be like a mental “scar” for life that won’t easily heal if at all. Here at Personal Injury Solicitors Manchester we have clients who have been in RTAs which weren’t their fault and so wish to get back the compensation they deserve. We always wish that the accident never occurred in the first place (prevention is better than cure) however we always hope that if an accident does occur, that it is NOT fatal or catastrophic. Our thoughts and condolences go out to the families of Aaron and Amy and wish them all the best for the future. The post 5 Common Road Accident Causes and What to Do if You Are Involved in One appeared first on Personal Injury Solicitors Machester. For over 100 years the automotive industry has grown exponentially both in numbers and innovation. We have some of the safest vehicles available today in comparison with a few decades ago, yet accidents on the road are a common occurrence and can lead to serious injuries. In this post I will talk about 5 common road accident causes, how to avoid them and what you should do if you are involved in an accident and are injured as a result. The UK has roughly 35 million vehicles on its roads, a lot of which are congregated in a select number of motorways and cities. From a purely statistical point of view, such a high number of vehicles in close proximity to each other in a small geographical area would suggest that there is a high chance for a collision to occur. After all we are all human and by definition we are prone to making mistakes. The main hope is to learn from them and not repeat them. It’s probably an obvious one and yet it’s in our nature it seems to rush. Couple this with our hectic day to day lives, rushing will result in speeding which may result in an accident with serious repercussions. From mild whiplash all the way to severe brain injury and spinal injury which can lead to paralysis. The latter 2 are life changing injuries which will not only severely diminish the quality of your life, but your loved ones too. The main way of avoiding/preventing speeding and thus a potential accident is to change your thinking. Instead of thinking that the speed limit is the minimum speed we should be driving at, think of it as the maximum level. In terms of time saved versus time “wasted” when speeding and not, there is very little in it (depending on your speed and distance covered) for most of us. If the average journey to work and back is 20 miles and the speed limit is 60 mph, it would take us 20 minutes to complete (60 mph / 60 minutes in 1 hour x 20). If we broke the speed limit and travelled at 66 mph the time we would save would be 2 minutes (6 is 10% of 60 so 10% of 20 is 2). Ask yourself, is it worth the risk of a fine and 3 points (that take 3 years to come off and 5 years for insurance purposes) for a 2 minute saving? Personally, my answer is no. Another obvious one, which also has seasonal peaks depending on the time of year and/or what events are currently happening in the country, but driving whilst over the alcohol drinking limit has serious consequences. Firstly due to the delayed reaction times, you are more prone to being involved in a road traffic accident which can be fatal to you and/or the other party involved. Secondly, if caught, you are treated like a criminal by being handcuffed and taken to the police station, having a criminal record (which can damage current and/or future employment opportunities) and have your license taken off you to name but a few. The UK government invests a lot of money in advertising and drink driving awareness campaigns for our safety on the road. It is just a matter of again, change your way of thinking about drink driving and cut it out as a bad and dangerous habit. I’m addressing young drivers here mostly as the numbers are as follows: 17-24 year old new drivers (especially male) are the target group which are more prone to having a car accident. This is why during this age, the insurance premium is also very high as the risk of a crash is greater due to inexperience in part, combined with speeding and giving in to peer pressure when behind the wheel (or “showing off”). Stick to the rules of the road. They are there for a reason. Take extra courses and tuition if possible, such as the Pass Plus. Just like when learning a new skill, focus and commitment is required. Try and anticipate the danger that may present itself. This is again coupled with the speeding point and the general “rush” of our daily lives coupled with all the external and internal distractions that are constant. Because of this, people who fail to look properly tend to just quickly scan the road at a junction especially in order to pull out to get on their way as quickly as possible. Obstacles that partially block their view are also a factor, however with due care and attention, a junction can be safely navigated. Again, it comes down to numbers and time you save when taking these quick decisions unnecessarily. E.g. if you travelled 20 miles to work and back and another 10 miles during day to day jobs that you have to do you would be covering 30 miles. If for every mile travelled you came across 2 junctions on average, it would mean 60 junctions in total on average daily. If you rushed and pulled out too soon, the time you saved could be anything from 1 second to 30 seconds. If the average therefore is 15 seconds, the amount of time you would save daily by taking unnecessary risks is 900 seconds (15 seconds x 60 junctions average per day) which is 15 minutes. This might sound like a large figure, however it is over the period of the day meaning that instead of getting home at 7pm, it would be 7:15. Let me ask you, what is more important to you – getting back home or to your destination late, or not at all? Next time, just think about it. By doing this, you will eventually “build” a new driving habit which will lead to a safer and stress free way of driving. There are a number of elements to take into account with this cause. Firstly and physiologically would be eyesight. If you cannot see distances very well and have no reference points in which to judge the speed of an oncoming vehicle, then simply get your eyes tested and wear glasses if necessary. Secondly inexperience can play a role in judging the path and speed of a vehicle. If you ask any experienced driver, they will most likely tell you that you develop a sort of “6th sense” after driving for a while and can anticipate better any dangers ahead and judge speed, distance and path better than a driver who hasn’t been behind the wheel long. Thirdly, negligent and careless driving could play a part in not judging another vehicle’s speed and path, resulting in potential loss of control of the vehicle causing an accident by dangerous driving. Here at Personal Injury Solicitors Manchester we hope that you are never involved in a car accident but if you are, we hope it is not serious. Depending on the severity of the accident, you may have no option but to wait for the emergency services to come out and assist you. If however you are in a position to diagnose yourself and are mobile, you should firstly stay calm and if not in a safe place, make your way to a pavement of any safe place away from other oncoming vehicles. Information: Share information, such as name, phone number, address, insurance details and car reg numbers with the other party involved in the accident. Photographs: Use your camera on your mobile phone to take pictures of the accident from different angles as this provides a vivid account and evidence of what happened. It can also be helpful to keep track of where the incident happened as a lot of things will be going on in your mind. Car: Make sure you take down details of the other parties car such as the make and model, colour and amount of damage caused. Witnesses: If there are any other witnesses around at the time of the accident, make sure to take down their information such as name, phone number, address as they can be used to provide evidence if necessary. Owner: Make sure you take down the car owner details if the driver isn’t the owner of the vehicle involved in the accident with you. Police: You should report the accident to the police to avoid any future disputes with the other party involved. Insurance Company: Make sure you inform your insurance company of the accident and provide any information they request. These steps are also published on our Road Traffic Accidents page. Safety is paramount on the road, couple this with caution and focus. With all these in play and an active way of thinking towards changing bad habits on the road to become good habits will play a significant role in your health and safety when behind the wheel. Over to you. What do you think? Let us know in the comments section below. The post Ayrton Senna is the “Driving Force” Behind our Sponsorship appeared first on Personal Injury Solicitors Machester. Ayrton Senna was not only a great racing driver, but a great man also who contributed a lot to charitable organisations in Brasil and worldwide. His death on the 1st of May 1994 at the Imola circuit in Bologna Italy was a turning moment in F1 history. After his death, the FIA appointed his very good friend Professor Sid Watkins who was then the chief doctor at the F1 races. Prof. Watkins was commissioned to improve safety in Formula 1, which he did to a very high standard that holds testament to today as Ayrton Senna was the last fatality for F1. This helped with the shift in mentality by the F1 drivers and the public to regard racing as a dangerous sport and that one should approach with extreme caution as your life is at risk when racing. This was a significant development as racing back then wasn’t such a safe sport as it is today, and this is because of the improvement that Prof. Watkins implemented. 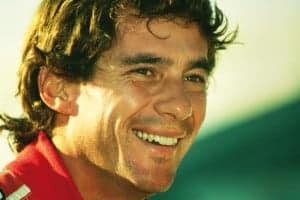 We would like to add our support to the website because it educates as well as informs people about the life of Ayrton Senna, which will hopefully inspire people to become better and safer drivers as we believe that racing is a great sport, but it should be left on the race track with professional supervision and not to spill out on the UK roads where serious injuries can and do unfortunately occur. 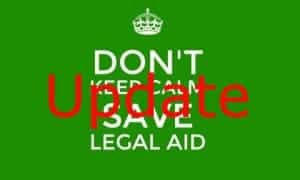 The post Legal Aid Update appeared first on Personal Injury Solicitors Machester. ‘Some solicitors are taking part in two days of action. Some have chosen not to take part and work normally. The Society will support and respect all of the decisions and choices our members make. Read more about it at the Law Gazette here. As a result of further discussions with the Law Society, the Lord Chancellor has agreed to make an additional £9m available to fund the introduction of interim payments for solicitors from this summer, a year earlier than had been planned. The above is curated news from the LawSociety in regards to the changes that are happening in Legal Aid.